We have done lots of different things with the change. Sometimes it is as simple as paying for the people behind us in drive-thrus, purchasing and delivering a meal to someone who looks like they need it, or sneaking into restaurants and paying for someone’s check without them seeing. We are always looking for new and creative ways to secretly bless people and make a tangible difference in our community. That is where you, our church family, come in! If you would like a jar to put in your office, have an idea of a new service project for us to try, or want to join us as we Change the Day, please contact Meghann Heinrich! We look forward to hearing from you! It has become a favorite tradition on this Sabbath to hear the WWU Wind Symphony under the direction of Brandon Beck. Please join me in thanking the many members of this superb organization for sharing their music with us. The prelude presents perhaps the most frequently performed piece written for concert band. The celebrated American composer Alfred Reed (1921–2005) studied in New York before joining the Army Air Force Band during World War II. At the age of 32 he became the conductor of the Symphony Orchestra of Baylor University where, during his teaching tenure, he earned his B.M. and M.M. in music. He spent the last part of his career leading the music department at the University of Miami. Especially in the final section, with much use of bells and chimes, Reed manages to evoke the sounds of Orthodox Russian worship music. As you listen to this great music I invite you to prepare your heart to worship God. Thank you for your generosity to the local ministry of the University Church, as well as to the global mission of the Adventist Church. Today, the loose offering is for Adventist Community Services. 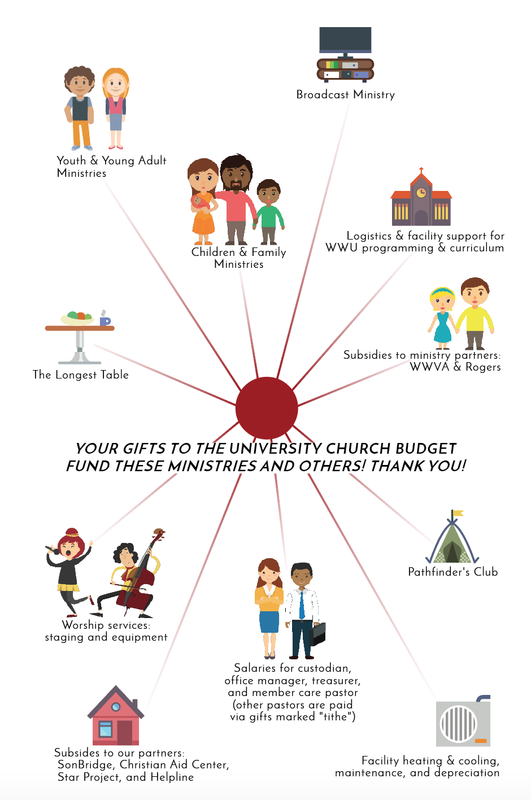 To give to the University Church budget, mark your gift on a tithe envelope. The Longest Night, a midwinter service of renewal and hope will take place on Friday, December 15 at 7 pm. Join us for a meditative service of music, reflection, and healing prayer. All church potluck at 1:15 PM today following Second Service in the Fellowship Hall. Everyone is invited. SonBridge Open House. Come celebrate the Education Center for Better Living on December 10 from 4–6pm. Enjoy refreshments, tours, and a celebration of our community's achievement! John Deming passed away on Wednesday night this week. His memorial service is being planned for Sabbath afternoon, December 9 at 4pm in the University Church. A donation account to help with medical expenses has been set up at Blue Mountain Credit Union. A German Christmas Sing-a-long is this morning at 10am in room 115 of the Melvin K. West Fine Arts Center. Contact Kurt Schäfer at 509.527.3116. Volunteer Spanish English Interpreters needed for Sabbath Services. Share your bilingual talent for this Spanish ministry. Students or members interested call Sandra Graham at 509.526.8011 for more information. Student missionary Christmas packages are in the lobby today. Please choose one to take and mail at the post office. Thank you for your help in this yearly tradition of supporting our students! Rogers Adventist School Christmas program for grades K-4 is Tuesday, December 12 at 6:30pm in the WWVA Auditorium. Walla Walla Valley Academy will present their annual Christmas Concert featuring their Band, Choir, Hand Bells, Singers and their Orchestra. The program will take place in the WWVA Auditorium beginning at 7pm on Sabbath, December 9 . The La Sierra University vocal ensemble UNITED will perform at the University Church on December 16, 2017 at 6pm. Come and enjoy “Miracle On Bethleham Street” a play and performances by the MSAS Band and Choir! The fun starts at 7:00 pm on Thursday, December 14th in our gymnasium. If you’re a medical doctor or dental hygienist and are interested in going on a mission trip to Bolivia with a church group in March, please contact Monique Morris at moniquemorris@gmail.com or call 509.540.9345.